Figuring out the cards to pick up in anticipation of a rise in price is a combination of luck and experience. 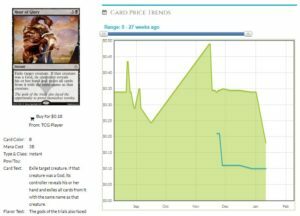 On MTGPrice, we try hard to present our ideas and our rationales behind those ideas. Today I want to review some of the cards that I want to get now, or in one case, that I’d wanted to get, and the historical examples. I’m very high on this card, I have to be honest. It’s not often that I like picking up all available version of a card but I absolutely do, for a host of reasons. Nonfoils: I think that this card is the backbone of a control deck in Standard, and it’s proven useful in any shell with blue. 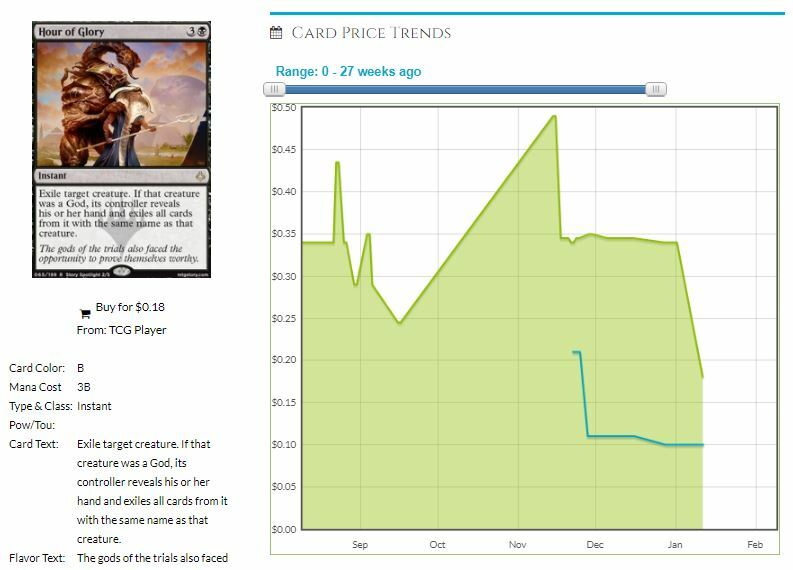 The only problem is that it’s not a four-of, more often a two- or three-of in such decks, and that might stop it from hitting $35. Foils/Promos: This is popping up in both Modern and Legacy, in control and Miracles lists, and it’s going to stay a useful card there. Jeskai, UW, Esper…all the decks are playing at least one now, and some as many as three. It doesn’t give you an immediate advantage, but if you can live long enough to flip it, it’s acceleration or it’s finding the next answer. Let’s not rule out that this is a very strong card in Commander or Cube formats, and those are soaking up a certain amount of available copies. 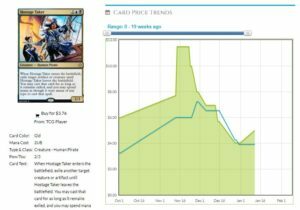 If there’s a chance that you’re going to build a control deck in the next 18 months, get your copies now. 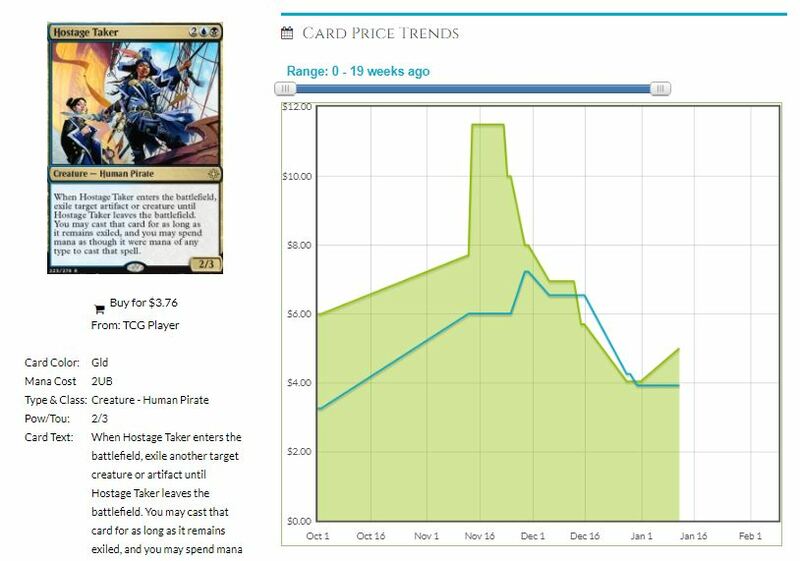 The set after Dominaria is about when I’d expect this to pop up to at least $25 nonfoil, and $30 is reasonable. The foils (and especially the promos) are a great pickup now too. Promo versions under $40 should be snapped up and set aside with the proper amount of patience. That will pay off. I studiously avoided mentioning this card until we were done opening it, and unfortunately, the cat is out of the bag. I’d really been hoping that this made it all the way down to $5, but it’s recently doubled from its low of $5.50. 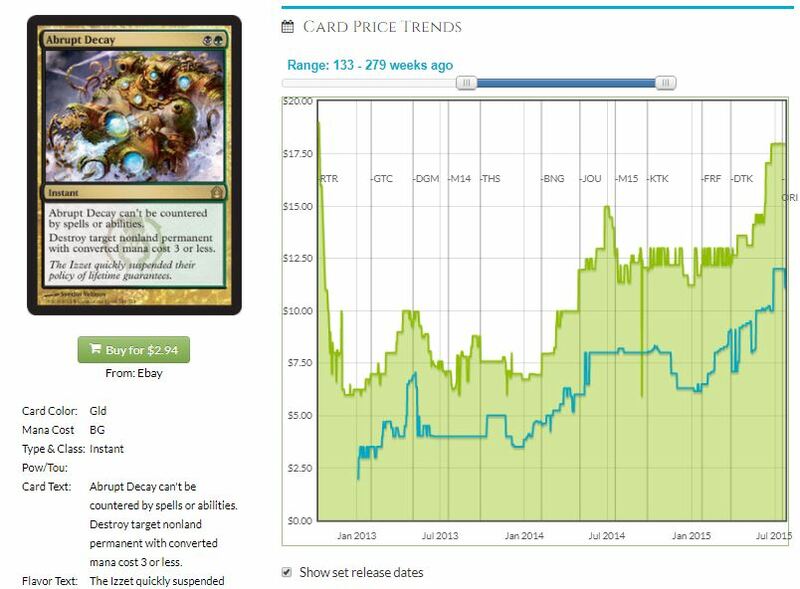 I’ve used this card as an example of the rise and fall of prerelease pricing, as it could have been had at $4. Hero’s Downfall or Abrupt Decay have graphs worth looking at. When it was in print, it was relatively cheap, but after it wasn’t being opened anymore, the popularity grew and the price doubled. 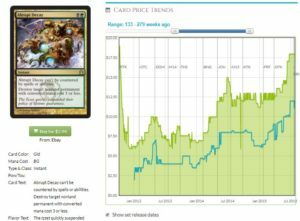 Vraska’s Contempt was going to be on this exact same track, with the price dropping and dropping until it wasn’t in print and then it would start climbing. The problem is, Contempt is a fantastic answer to two powerful and prevalent threats in Standard: Hazoret the Fervent and The Scarab God. Let me contrast Contempt with another card that does 80% of the same work: Hour of Glory. Be honest. Did you remember about this card? Oblivion Strike at rare! That price graph tops out at fifty cents. Hour of Glory hasn’t even been a sideboard card in its lifetime. 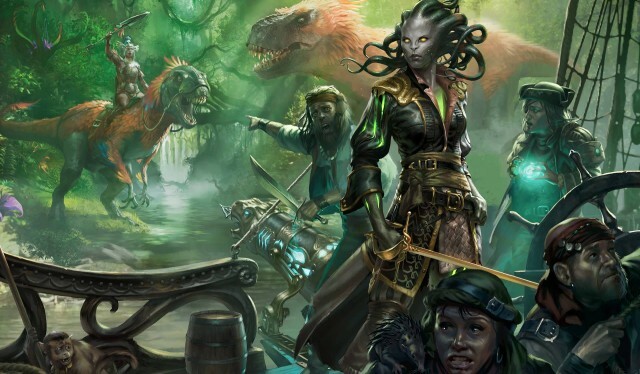 A big part of that is some unfortunate timing: Hour of Glory was released in Hour of Devastation in July 2017, where Vraska’s Contempt came out three months later. There’s a chance that these cards were planned to be in different blocks, with 18-month rotation or rotation every set, but the threats have never been severe enough to warrant playing Hour of Glory. Contempt has popped since it’s become the go-to spell for removal, as it can answer a Planeswalker effectively. I really wish there was time for it to fall back down, but I imagine that the price will stick at around $10 for about the next 12 months. Remember when this was $12? It wasn’t that long ago. The Taker is seeing a fair amount of play in Standard, and popped up as a singleton in the sideboard of Traverse Shadow decks at the Modern Pro Tour. It hasn’t stopped being good against the cards that need exiling, and I have to admit that being able to exile their Death’s Shadow and then replay it yourself is an amazing 2-for-1. What makes this extra appealing is the timeframe. It’s got a whole year, several big sets to work with. I can’t imagine that there’s a better enabler of this effect than Panharmonicon, but who knows? It’s a Pirate, a tribe that’s unlikely to be better with these other sets, but the color combination has always been excellent when it comes to control decks. I don’t think this is going to be a big player when it comes to casual play, but seeing the price it was at before, this seems like a very strong candidate for popping back up to $10 anytime in the next year. Snagging these at $5 or less right now is pretty amazing.